The soils within this region have been mapped as part of a number of soil surveys that cover parts of the region. The generalised descriptions below of the major soil types in the Werribee region are based on those from Sargeant (1998) and Maher and Martin (1979) and relate mainly to the soils in the Wyndham Shire. This website will provide more detailed maps and information about soils of the region over the coming months. 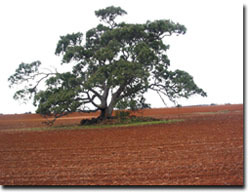 These soils generally occur on low rises and hills in the Werribee Plains region. Surface soils are generally shallow (10 cm or less) and are reasonably friable dark brown to dark reddish brown silty or fine sandy clay loams, to light clays. Basalt stones and boulders may be present at the surface. The subsoils are similar in colour (or redder) and are heavier textured, medium to heavy clays that are sodic and moderately to strongly alkaline. With depth, the soils become paler in colour and often have yellowish brown mottles. Soft calcium carbonate (lime) concretions generally occur at about 50 - 80 cm depth. Small fragments of weathered basalt to stones of variable size generally occur before 1 metre depth. These soils are mainly classified as Red Sodosols using the Australian Soil Classification. Where the land has not been cleared of stone, these soils are used for cattle or sheep grazing on unimproved pasture. When cleared of stone, the soils are used for improved pasture, hay production and cereal cropping. These soils generally occur on gently undulating plains in the Werribee Plains region. Surface soils are generally shallow (10 cm or less) and are reasonably friable dark brown to dark greyish brown silty or fine sandy clay loams, to light clays. Basalt stones and boulders may be present at the surface. The subsoils are generally dark brown, dark reddish brown or dark greyish brown medium to heavy clays that are sodic and moderately to strongly alkaline. With depth, the soils become paler in colour and often have pale yellowish grey and yellowish brown mottles. Soft calcium carbonate (lime) concretions generally occur at about 50 - 80 cm depth. Small fragments of weathered basalt to stones of variable size generally occur before 1 metre depth. These soils are mainly classified as Red Sodosols using the Australian Soil Classification. Where much of the land has not been cleared of stone, the soils are used for sheep and cattle grazing on unimproved pastures. Where areas have been stone picked, they are cropped on a rotational basis with grazing. 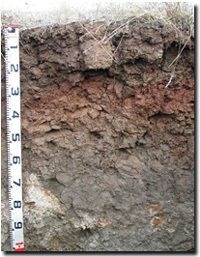 Example of soil profile developed on basalt. calcium carbonate in the deeper subsoil. These soils are of minor extent in the region and occur in association with the soils described above - mainly in minor depressions and drainage lines. 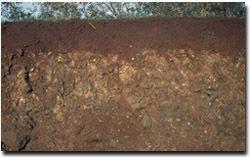 The surface soil generally has a high clay content (light to medium clays) and a neutral to near neutral pH. Subsoils are even more clayey and strongly alkaline and sodic. The soils typically crack deeply when dry. These soils are mainly classified as Grey Vertosols using the Australian Soil Classification. Soils developed on Pleistocene alluvium (i.e. 'Werribee Delta'). The surface soils are mainly between 20 - 35 cm deep and are generally friable brown to greyish brown silty to fine sandy clay loams and fine sandy loams which are slightly acid. When dry, the soils are hardsetting. The subsoils are generally dark brown, dark reddish brown, or dark greyish brown medium clays which are mainly sodic. With depth the soils usually become lighter textured and paler and greyer in colour, often with yellowish grey and yellowish brown mottles and are invariably moderately to very strongly alkaline. Soft calcium carbonate ('lime') concretions generally occur beyond 80 cm depth. These soils are mainly classified as Red Sodosols using the Australian Soil Classification. These soils are extensive around and south of Werribee and are often used for vegetable production. These soils are similar to the soils described above - but are greyer in colour (probably due to poorer drainage). 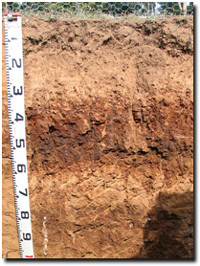 Surface soils are also generally slightly higher in clay content (i.e. fine sandy clay loam to light clay). There is a range of other soil types which occur in association with river terraces, drainage lines and depressions, and swamps. These are only of minor occurrence throughout the region. Maher, J.M. and Martin, J.J. (1979). Soil and Land Survey of the State Research Farm, Werribee. Department of Agriculture. Project Series No. 41. Maher, J.M. and Martin, J.J. (undated). Soils of the MMBW Farm, Werribee. Department of Agriculture. Project Series No. 42). Sargeant, I.J. (1993). Soils and Land Use Study of the Skeleton creek Catchment. Melbourne Parks and Waterways. Sargeant, I.J. (1998). Geomorphology of Wyndham. Wyndham City Council. White, L. and Kelynack, J. (1985). "Land Resources Data Atlas". Melbourne and Metropolitan Board of Works & Department of Conservation, Forests and Lands.